For a striving nation with a vast majority of the population living below the poverty line, it is always difficult to come up with success stories, to prove a point or to be vocal. The lower income brackets have always found it difficult to make a mark in the society because of ignorance, indifference and so forth. But education has carved a path into their lives. People are now more aware of the significance of basic education and how it plays a massive role in developing an individual, a family, a society or even an entire nation. For many years now the non government organisations (NGOs) have been trying to reach out to the underprivileged children. The journey so far shows positive results from many organisations, some of them being Phulki, JAAGO, BRAC and many more. Some organisations are unique in their own ways as they follow certain rules, which in other words is their way of functioning. Some deal with male students while others give preference to both genders. There are few who mainly work with females and term them as 'Girl Domestic Worker' (GDW) – girls who work in households. Phulki is an NGO that focuses on the GDWs. The societal norms and taboos have always forced women to limit their thoughts and visions thereby compelling them to lead a stereotype lifestyle. Although the concept of dowry and early marriage has reduced over the years, the greater need for educating a girl-child has always faced difficulty in getting support from the families. Phulki, in this case, plays a crucial role in taking the initiative to help the girls to get an identity trough education. The problem that was faced by the organisation initially was that the girls were all domestic workers. That was when the concept of non formal education started within the Phulki team. More girls got interested in learning and many families began to support this initiative. “ I did not get a dress for Eid,” says another child, Rohima. “I was told that since I work as a part timer I would not be given a dress. I was given only 20 takas as my Eid bonus. Even then, I protested because it was Eid and I deserved it. But my employers ignored my protests.” These children understand the fact that they should be vocal about their thoughts and opinions and education makes them aware of their rights and how to achieve them. It also makes them more self conscious and grows confidence within them. Ranging between the ages of 8 to 18 years, the children would be able to prove themselves for sure, only if they are given a chance to showcase their talents and intelligence. Asma is a 14 year old girl who had to face a lot of questions from the society before she started school. Many had said that she did not even have the skills to sew, how would she be able to manage her studies? But she proved them wrong. Today, she is a good student, knows how to sew well and even repairs basic machine damage. Just like Asthma,other domestic workers would also instill the same amount of confidence and intelligence within them. This will also help them to get better jobs once they are older. Most parents would want their girl-child to be educated. If there is a choice between educating a girl or a boy, the choice has always favoured boys. But now scenario has changed and parents understand the value of educating the girls also. Rabeya's father has been running a wood business for the last ten years. He had always encouraged his daughter to get the basic education. She also helps her father in the business and today they have a decent earning. Today the family values her opinions and she herself is an independent individual working at a company with a good salary. Shayera Moula works with the local media. She says that as a student she was chosen for a workshop where she had to deal with the underprivileged children. "I was chosen to do a workshop on Social Entrepreneurship and on Social Services from BRAC University which was held at Turkey when I was a sophomore. When I got back, I had the chance to work with an organisation called Streetwise where I interacted with street children." She mentions that other than giving them basic education, she also thought of giving them practical learning as well. "I suggested that children should learn to save money. So I proposed a banking system using a piggy bank and they could even persnonalise it. We helped them to decorate the bank and it was necessary as it gave them an identity and also they felt attached to it. An incentive was also given to encourage these children to save more money," Shayera added. Now she says, the concept has created a different perception within the organisation and more children are saving money, though in a small scale. Female children now have the opportunity to stand up for themselves. But the society needs to realise the fact that education must be for all. The underprivileged are the ones who often get ignored and looked down upon, but we should always try to see the other side of the story because they are keener to learn. The society should come forward to support this class and every community needs to set up schools for these children. The change is here, so we should support the change for a better tomorrow. The children sing with all their heart and soul for the visitors inside their classroom. Dressed in their regular clothes, the children of class 4 in the Brac School located in the Karail slums, try to outdo each other with the brightest smiles and confident expressions. These children belong to the underprivileged section of the society. 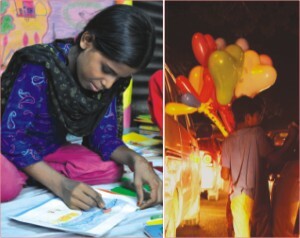 Many of their parents are either rickshaw pullers, domestic workers and some of the lucky ones even have parents who own small shops inside the slum area. Of course, there are some who have never seen their father. 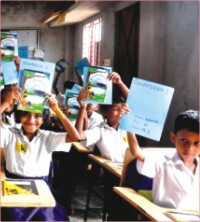 Brac has the highest number of schools for the underprivileged children all over the country. After the children go through the pre-primary and primary schooling, they are then admitted to government schools to start with the 6th grade. "All my students are very dedicated towards their studies," says Fatima Akhter, the young teacher. "However, sometimes because of unavoidable circumstances in their respective families, the children miss school. For instance, when the mother is out working, sometimes the daughters have to take care of the cooking, or the sons would have to take over their father's shops," says Akhter. "But we have monthly meetings with the parents where we talk to them about encouraging the children to concentrate on their studies so that at least they will be able to finish with their basic education." There are many more organisations in the country that are trying to educate the underprivileged in the hopes of eventually eradicating illiteracy and, in the long run, poverty. In fact, the responsibility now lies with every individual to look after one child and educate him or her and have him or her stand on his or her own two feet. After all, for a country to prosper, the children need to be nurtured from a very young age belonging to all walks of life. One never knows, there might be another great leader, a talented actor or another Nobel Laureate hiding amongst the young crowds by the slum areas or the traffic signals. They are everywhere. Pushed back to the margins, they still seep into our comfortable lives, which are far removed from the slums and streets that they call home. They sometimes sell you odd tidbits, from food with strangely catchy names like poppon, to picture books for your children. You look away as images of animals and flowers stare back from the other end of the window. One protests that they indeed are anywhere and everywhere, argues it is for them that Bangladesh now faces dilemmas of overpopulation, shoves them aside because they are simply getting in the way. Movies have been made while much has been seen on the television and the papers. You have seen it all. Soldiers who help to keep the engines of the major cities kicking, these small children sometimes have to work round the clock, experiencing life as we least know it. Before one has the chance to delve into that part, other tags are slapped on and attention takes its predictable turn. Glue sniffers, drug dealers, muggers one big, hopeless breed, stuck in one insufferable cycle. And you think you have seen it all. Because these kids have more to them that would leave you dumbfounded and have you thrown completely off your guard. They are smart, energetic and confident, and most of all, they are dreamers. And they sit in classrooms, biding their time to go beyond the boundary we confine them in. JAAGO gives them that push. JAAGO Foundation has stepped into its fourth year in its endeavour to fight illiteracy amongst children living below the poverty line. Founded by Korvi Rakshand, JAAGO and its many initiatives are drawing much attention in the capital city as the organisation continues to grow. 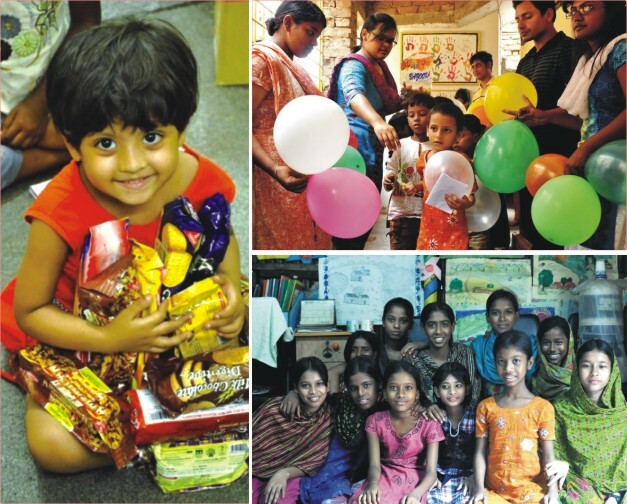 Their school, situated in the slum area of Rayerbazar, provides education in the English medium. 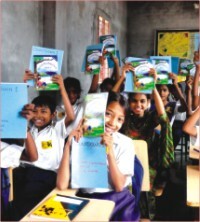 A sponsor helps a child receive education by granting Tk. 1000 every month. The school appears to be a haven for the many kids who are now enrolled there. It comes as a pleasant surprise soon as one takes a step inside the three storied building with walls adorned with paintings. Happy greetings such as 'How are you?' ring out as faces beam from across the classroom, curiosity and eagerness to talk all but evident. They are not some children growing up to be criminals; their language is not cluttered with cuss words and their faces are not grimy. They are children who are just living their childhood. In a conversation with Zihad Zaman, General Secretary of JAAGO, it became obvious how the school managed to carve out its niche so successfully in its community. Sparking negative sentiments towards the beginning, it slowly convinced families living in the locality into sending their children to school, for which all the members and volunteers would take to the slum areas to talk and to assure. A fresh graduate from an American university, Zaman has found his calling; JAAGO is everything to him for now. Currently the school has 280 kids with four classesReception, KG I, KG II and Class I, all running in two shifts. As many as 1000 children are still in queue. The school now receives commendable feedback from the community, so much so that now it is hardly required to go and convince the parents. The number of dropouts is at its minimum. One student had to drop out after his unemployed parents moved back to their village home. This was, however, not a good enough reason for him to stay away from school, for after a few days, he was seen back in the classroom, having run away from his village. The family was then persuaded to shift back to the city so that the child could continue with his studies. For cases such as these, JAAGO creates opportunities for parents who are out of jobs, so that they remain in the city while their children can continue with their schooling. The school organises special fundraising events on occasions like World Health Day, Universal Children's Day or International Women's Day. Other events regularly held are Reading competitions and Great Kindness Day where each student jots down a list of kind acts they would like to do. Children look forward to these events with great enthusiasm. Eva, one of the teachers, is a recent graduate and has been with JAAGO for quite sometime. When asked what brings her to the school every morning to be with the children, she said it is their wonderful quality to be fascinated by everything that is shown or taught to them that she finds most endearing. She adds how the interactive classes and the extra curricular activities like singing, painting and gardening break the initial inhibitions and fears and help bring out the best in them. With each passing day, they get more involved and competitive. They want to dress clean and look presentable, thanks to the session of Hygiene and Manners held every week. Jonaki, studying in Reception, is a chirpy girl whose favourite subject is English. She loves Pinocchio and she wants to be a police when she grows up so that she can beat up the local goons. Tanvir from KG II loves Science and IT classes. He says school is the best thing about his mornings and he will not miss a day unless he is sick. What is refreshing to learn is that none of these children are into work; their parents want them to stay in school. Julekha Akhtar, whose daughter studies in KG II says despite the many hardships she faces, she will make it a point to keep her child in school for as long as she can. With a proud smile she adds her Jhuma has never failed in her studies. Fatema, mother of Jonaki is so involved with JAAGO that after having sent her daughter to school, she herself joined as one of the support staffs. Her gratitude is immense. A single mother, she says, JAAGO has given her a direction in life. Her daughter is doing well and she wants to keep the journey going. JAAGO has plans of expansion with the ultimate aim to build a school in each district. 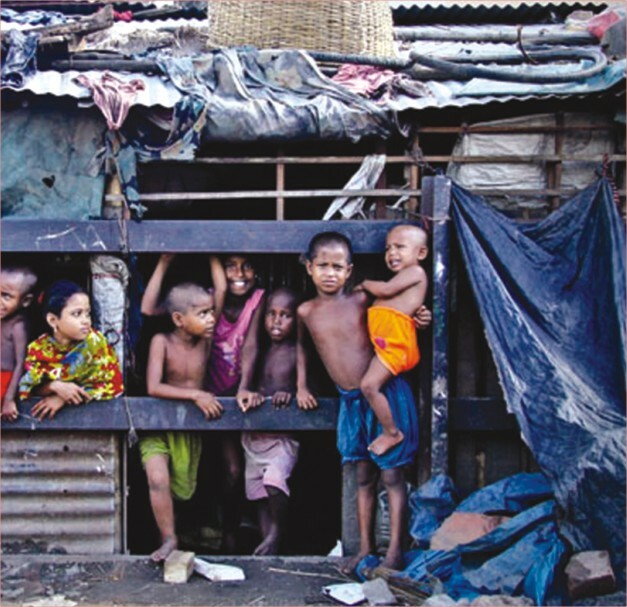 They are currently setting up schools in the slum areas of Banani and Tongi. The organisation stands as a testimony to how one small act of giving creates ripples of positive changes in a community. Let us keep their message alive and help the invisible soldiers break out from the stereotypes that we so easily cast them in.